Irrigation Drip Line is a length of pipe with inbuilt drippers positioned evenly along its length. 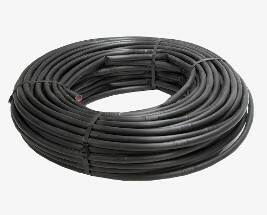 17mm Drip Line is ideal for large garden beds, hedges, nature strips and vegetable gardens. Drip Line can be used with pressure compensating drippers to ensure water is delivered more evenly along the entire length if the tube. Make use of connectors to easily integrate Drip Line into your irrigation system also purchasing pegs to hold the Drip Line in place is advised as it can be quite stiff when uncoiled. 17mm Drip Line is a better choice over 14mm Drip Line as it can be run for longer distances. This is due to the larger pipe causing less friction loss, thus creating less pressure loss, allowing the water to flow further. Drip Line is quoted as internal diameter (ID) as the fittings push inside of the Drip Line.